Ahmad Mohamed al-Kuwari and Sheikh Hamad Abdulla al-Thani shake hands after renewing their partnership agreement for another 10 years. End-to-end managed IT services and solutions provider, Meeza, has renewed its existing contract with Vodafone Qatar to host the telecommunications operator’s IT infrastructure in Meeza’s state-of-the-art data centres for another 10 years. 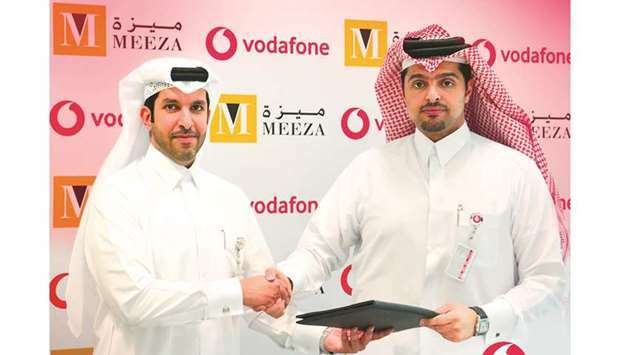 The renewed agreement was signed by Meeza chief executive officer Ahmad Mohamed al-Kuwari and Vodafone Qatar chief executive officer Sheikh Hamad Abdulla al-Thani. Since Vodafone Qatar’s establishment in 2008, Meeza has been providing data suite, IT equipment hosting, and co-location services with Tier III service level agreements. Offering a guaranteed uptime of 99.98% in adherence with world-class efficiency and risk management standards, Meeza’s M-VAULT series are the only design and build Tier III certified data centres in Qatar – with the company’s M-VAULT 3 being LEED Gold certified and the M-VAULT 2, LEED Platinum certified. Meeza data centres offers unprecedented and unparalleled flexibility and reliability in Qatar and the region. Primarily offering managed IT, data centre services, cloud services, and IT security services, Meeza is fast growing as a recognised power player in the smart cities and Internet of Things (IoT) arenas. Al-Kuwari said, “Vodafone Qatar has always been one of our most important and influential clients, and renewing the contract with them for the next 10 years has enhanced our confidence in serving them to the best of our capabilities. Sheikh Hamad said, “As we move Qatar towards being one of the most digitally-connected countries in the world, it’s crucial that we can count on the strongest and most reliable technical partners to support us in fulfilling this ambition.